12 tracks: Skipper On The Shore * Song Of Time * The Bomber * There Was A Day * Farewell Harry Patch * White Sands Of Morar * The Cocklers * Sambos’ Song * The Lord Middleton * Francoise In Flanders * The Wyre Waterside * The Minstrel. 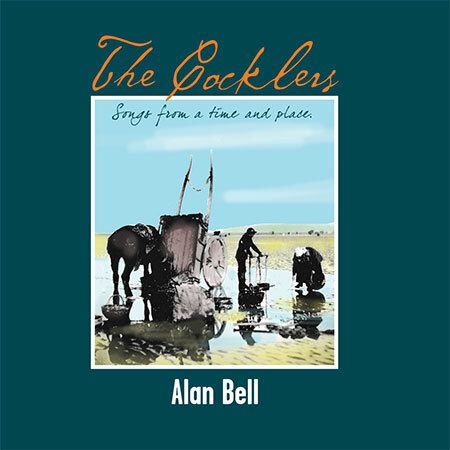 Alan Bell is a veteran singer/songwriter from the North-West of England. His best-known songs, amongst many, are Windmills and Bread And Fishes - the latter was recorded in several countries and was a hit in Japan. Alan also wrote for a number of radio and TV productions. He was a member of the famous Blackpool Taverners Folk Group who performed in clubs, concerts, on radio and television and released four LPs. They also sang at a Royal Command Performance. It was in the 1960s that Alan began writing songs in the folk idiom about the Fylde Coast in Lancashire. Over the years his songwriting developed and he explored other musical genres. He wrote song cycles for choral societies, musical suites for brass bands and songs for Radio Ballads. The Blackpool Taverners sang many of Alan’s songs before the group disbanded after twenty years. The songs on this album are about events and people within the North of Britain. On this album he is accompanied by members of his Alan Bell Band - Andrew Green (guitar), Eddie Green (bass) and Sue Jennings (fiddle) - plus Chris Carter (piano and snare drum) and Becky Hoyle (backing vocals). The songs cover such diverse subjects as The Cocklers (the Chinese men and women who in 2005 died on Morecambe Bay on the dangerous rising tide); The Bomber (the American Liberator which in 1940 crashed onto the Freckleton Primary School near Preston, killing over sixty men, women and children); Farewell Harry Patch (the last veteran of World War I who died in 2009 aged 111 years); The Lord Middleton (a fishing trawler which, during WW2, served as an anti-submarine ship, sailed on the Russian convoys and even took part in the D-Day landings before returning to the fishing) and The Minstrel (a tribute to the men and women of the variety theatre and in particular the 1930s). Every song has a real good story to it. The album was recorded by Chris Carter at Bluebird Recording Studio in rural Preston and the photographs are by Henry Iddon. This is an excellent companion to Alan’s previous Greentrax album The Definitive Collection.